My Aspire would be completing it's first year next month on 2nd September and it has clocked 13,000 Kms on the odometer so thought of putting down some points on car behavior and overall performance of the car. This month has being disastrous in terms of monsoon traffic in Hinjewadi, so while driving to office last week I had exactly a week's fuel left in the tank from last month. I was getting stuck in B2B traffic every day spending close to 1 hour 30 mins for covering one way distance of approx 28 kms and with heavy rains I still managed to get 17kmpl mileage in these conditions. The recommended PSI is 32 on stock MRF tyres however I noticed that last month I had missed checking tyre pressure which I normally do every 15 days and it dropped to around 28-29 PSI in all wheels surprisingly the mileage figure was happily climbing to around 19 kmpl in the city. I felt slight sluggishness during quick overtakes but not much difference in sedate driving experience. Need to test this further for confirmation on mileage impact. No major issues encountered with Aspire over the past 1 year and it has being a stress free ownership experience barring stupid goof ups Talera Ford made in updating my car and personal records with Ford customer care and failing to follow few instructions related to cleaning during service visits which they resolved to my satisfaction. Dealer has shared 2nd year Bajaj Allianz insurance renewal quote for Rs 18,300. 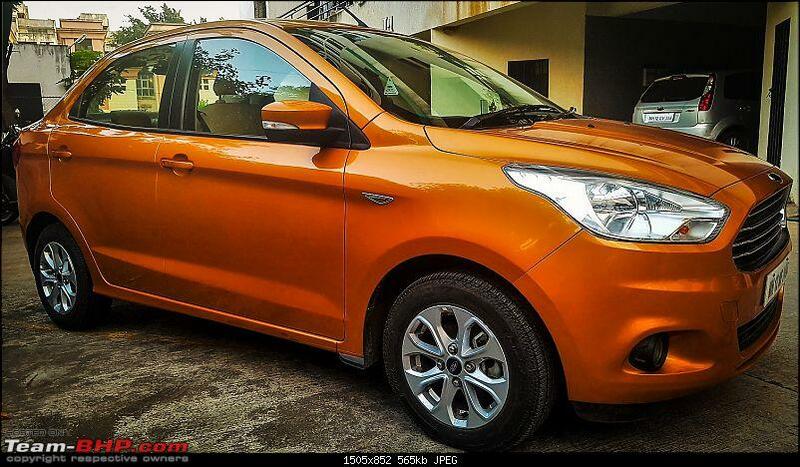 I have come across feedback from many Ford owners who caution about the real test on after sales service that begins from post 1st year of ownership of Ford cars, so keeping my fingers crossed for my Aspire. I also need to get the LHS section around front dashboard checked for rattling issue, it sounds evident while driving in 1st gear and similar issue was fixed during the first servicing when I had rattling issue in the rear section of the car. I would have to carry out wheel alignment and balancing externally as it way overdue and I also want to check with workshop if rear boot lid is available only with the Ford Aspire badge now as I last read Ford was dropping 'Figo' branding for Aspire and that is the reason I have not given it for replacement due to a minor dent incident that happened in Feb this year. Above all personally I cannot thank my luck which has helped me to keep my car protected from any dent or scratch caused during driving over the past year , my track record with Alto and Beat was dismal in this regard. ABS and EBD have proved helpful to some extent because I hate the sudden jerk style braking on our i10 in constant stop and go traffic. I also want to check with workshop if rear boot lid is available only with the Ford Aspire badge now as I last read Ford was dropping 'Figo' branding for Aspire and that is the reason I have not given it for replacement due to a minor dent incident that happened in Feb this year. If you didn't know this already, I'd like to inform you that the badging is just stuck with 3m tape on the boot lid. And the service centre guys stick it on after painting the lid. 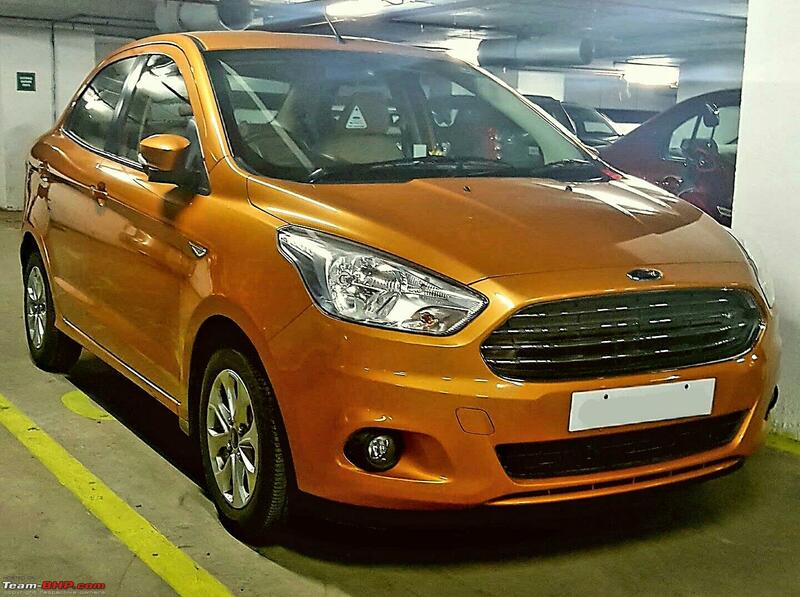 So all you need to do is remove the Figo badging. 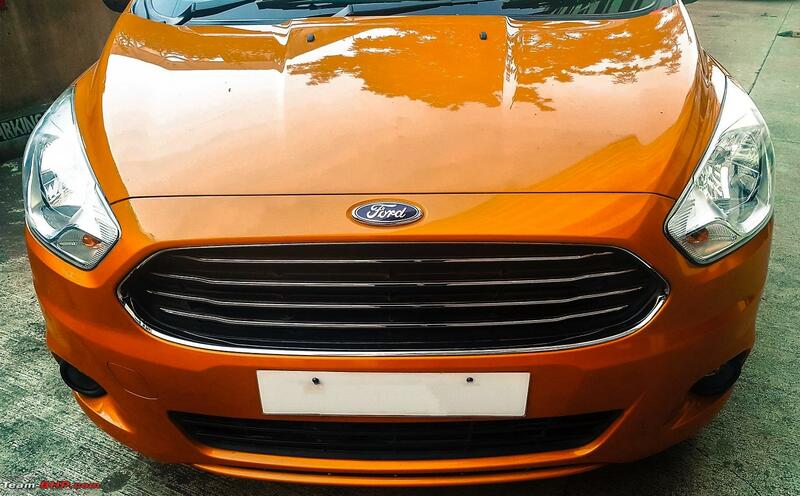 The Ford logo and name badges are insanely priced - the Ford oval was Rs.4000 odd, and I think the logos were upwards of Rs. 3000. On the other hand, the whole boot lid cost less than Rs.4000 FYI, the chrome strip is also separate. Congratulation KG on completing a year on Sep 2nd, 2016. 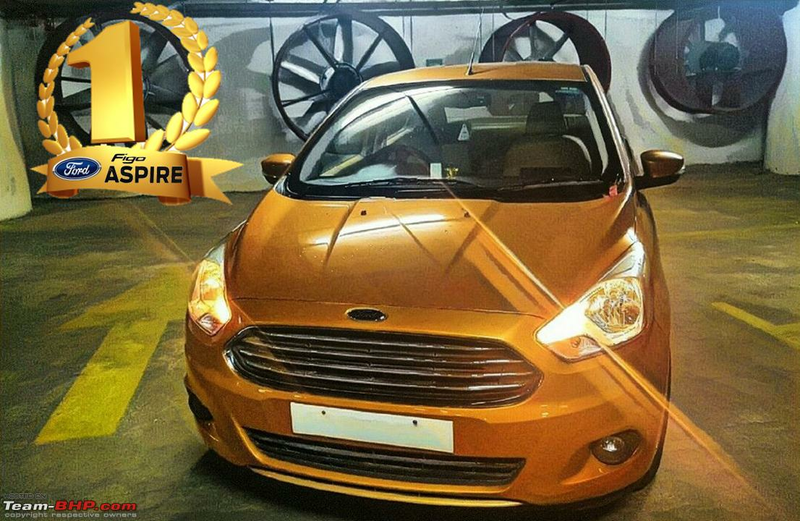 My Figo Aspire Titanium TDCi completed first year on the 4th of September this year as I recollect visiting Talera Ford Gunjan Talkies outlet at Yerwada on a Friday morning and it was a moment no less than a movie opening night for me. 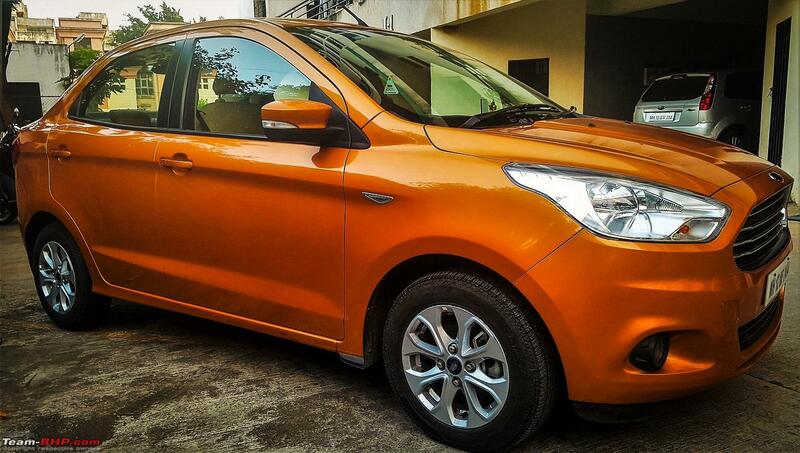 Figo Aspire won my heart and mind during its test drive trailer kind of sneak peek. Overall design of Aspire with the commanding front grille grew over slowly and that rush of experiencing exhilarating torque every time you hit the pedal is still alive and kicking. 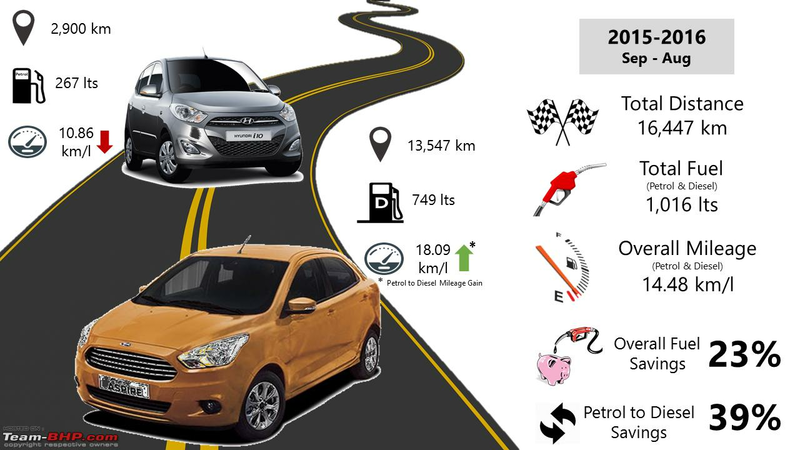 I was aware about the changing trends of consumer preference for passenger cars shifting from diesel to petrol, the hot favorite compact sedan segment had started to have been overtaken by SUV/MUV and premium hatchback cars. 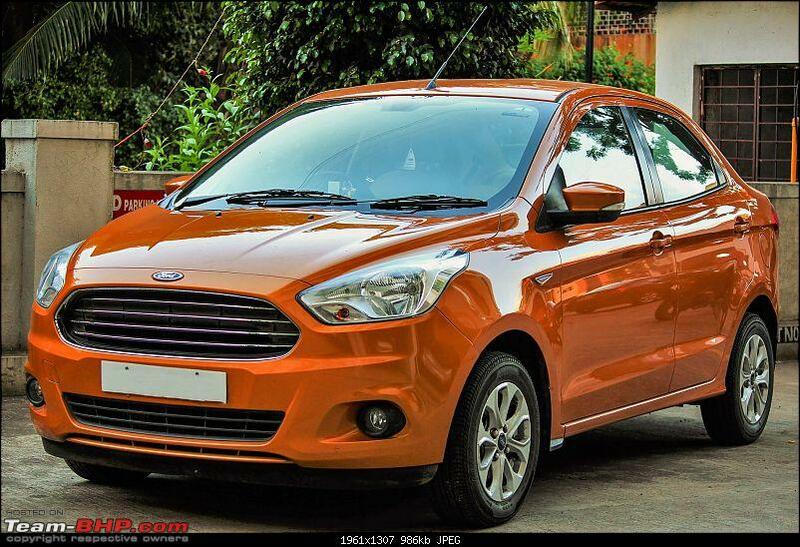 I had planned to look at all options where my on road cost of buying any new car did not go beyond 10.50 Lakhs INR. I did have diesel car on first priority because of my daily driving distance and for fuel economy. My decision to buy another petrol car was swaying between automatic OR premium interior and feature packed variants. Exchanging my 5 year old Beat (LT Petrol) for another car of an American brand made me felt apprehensive initially because most car buyers like to play safe with the top 3 brands in India. I was willing to risk trying Ford brand for the machine itself and frankly speaking every time I used to hear or read about General Motors shrinking market presence, I never felt that my Beat had given me serious issues during the entire ownership period and overall feedback on after sales service was mostly positive for me with Singh Motors. Ford India is having a bumpy ride currently and probably would continue this streak in near future too when it comes to sustaining consumer interest in their cars. I would come back to this later with a brief analysis of why the Figo twins could not manage to generate any significant buzz post launch phase. For me the joy of daily driving and having dealer outlet + workshop presence closer to my residence is far more important than the extra cash earned by the car on resale. One should be worried about the after sales service of a manufacturer if most dealers in their location/city have a bad track record and if service center of a 'XYZ' brand closes however new ones do not come up. While interacting with service center staff we are not just dealing with the brand but with human beings too so it matters how good you can be in forging a temporary rapport with the service advisor. Car buyers do not crave for flashy lounges, free refreshments and frequent special attention however some basics are essential for car companies to meet satisfactory standards that help in building positive customer feedback. Car owners who drive their vehicles in urban areas most of the time have backing of well-established service and spare parts network of all major car manufacturers so unless you take your car out on the highways too frequently the lack of a wide service network should not be a concerning factor. 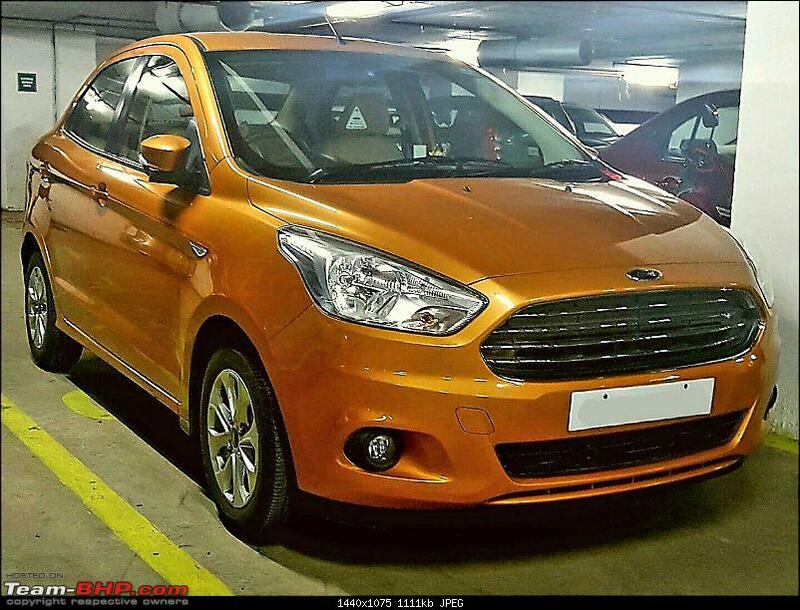 Without further ado I now share my 1st year ownership experience of Figo Aspire which is almost like a fresh detailed review supported with some stats that I could manage to maintain diligently for the comparison. 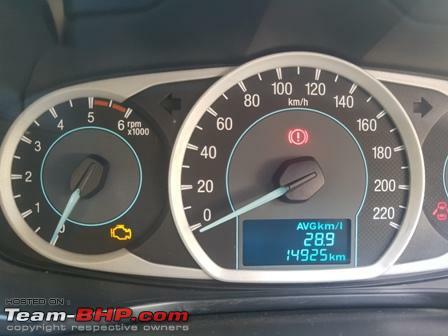 TDCi engine definitely shines for Figo Aspire and it comes not just with power but offers good economy if you can manage to drive this car in a disciplined way. Suitable for quick overtakes in the city, spirited driving on the highway and it does not disappoint with any lag whatsoever below 2K RPM for sedate driving moments. Rev happy engine that starts picking up pace with a linear power delivery from 1100 RPM itself and I think probably a second phase of torque kicks in around 1700-1900 RPM band, behaves well even when pushed up to 3K RPM. Aspire does not require frequent downshifting once you get a hang of the engine behavior and acceleration cues. Throttle response is mature and the engine does not get overtly grumpy to bother you with noise inside the cabin. Gear throw feels slightly longer than other cars I have driven and reverse gear slotting requires improvement. With great power comes great mileage?? No, Not possible right! 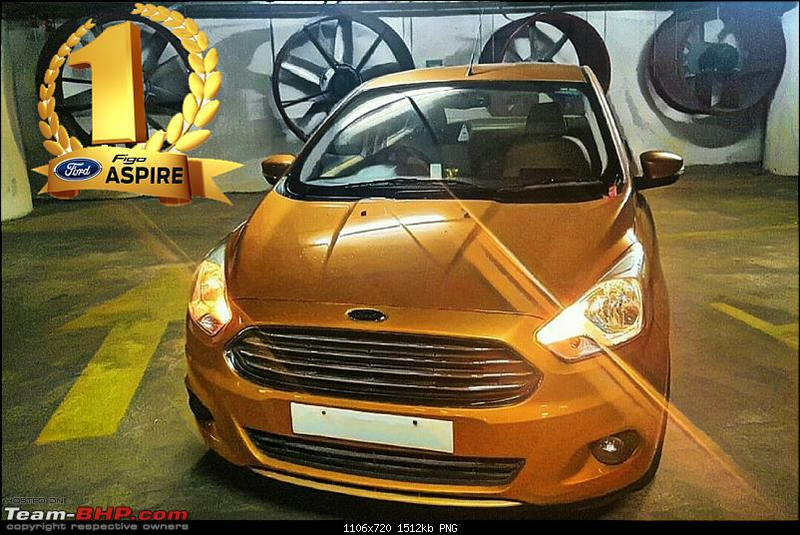 I am content with Figo Aspire even if it does not deliver stellar mileage like the big league best sellers, it has given me acceptable fuel economy for the power and torque it packs. 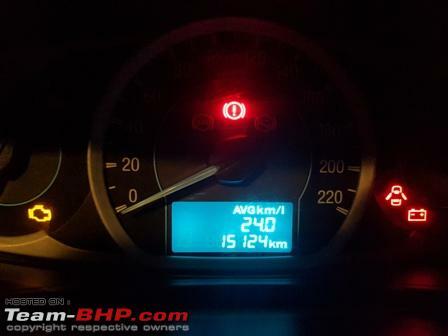 I was factoring threshold of 17 kmpl mileage in city and up to 21 kmpl on highway driving during regular use to the ARAI certified figure of 25.83 kmpl for this diesel Aspire, have managed to extract 25kmpl mileage on Mumbai Pune expressway with engine revving restricted to 2K band on RPM and speed not exceeding beyond 90 kmph. Figo Aspire goes out only on weekdays for office commute and very rarely do I take it out on weekends for short trips in the city. City-Highway drive ratio is at 90:10 for the first year. AC was in full use during summer and during monsoon I did not need to use it much, also had to turn on defogger occasionally for short duration. Driving last month to work was horrendous as it took me minimum 2.5 hours to cover a distance of approx. 56 km, this went on for at least 10 days in a row. Come September and Lord Ganesha brought in much wanted relief as monsoon took a pause and the overall volume of traffic slid into a relaxed zone with the advent of Ganesh Utsav. I reset secondary trip meter on every first day of the month and captured mileage stats in the images below from 1st and 2nd September when the rickshaw union had called in a strike any many app based cabs were off the road to avoid trouble. 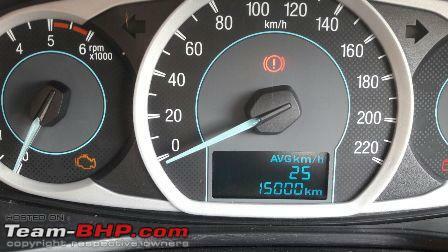 This would give you an idea of the ideal mileage Aspire is capable of delivering in city with moderate to low traffic. 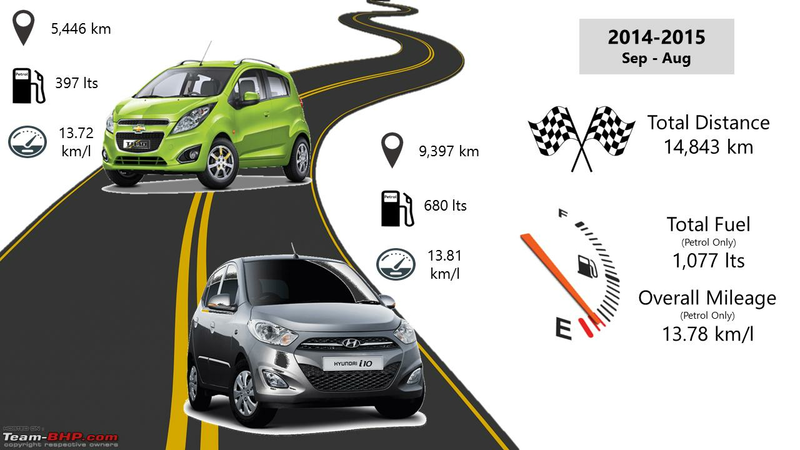 The i10 was extensively driven last year so it returned decent city mileage and Beat was too stable in its own category. This year i10 was lying idle for the first half of 2016 and was used for very short trips around residence, battery also went kaput exactly on completing 2nd year on the calendar. Aspire on the other hand has covered most miles and apart from one tyre puncture incident and few days of driving on low PSI unknowingly in July there were no major issues that impacted its mileage. I refill Aspire always with 30 lts of diesel which covers a running distance of 560-580 kms, lasting approximately for 12-14 days until next visit to the fuel station. Ground clearance is good and I have not encountered any weird or damaging under body scraping incidents. Steering has only height adjustment, no tilt/telescopic feature. It manages to stay light while driving in the city and gains confidence inspiring weight at the center when cruising at high speed. ABS and EBD have saved me quite a few close shaves due to sudden braking while driving in B2B traffic. Suspension is very comfortable and tuned suitably to deal with non-threatening potholes & bumpy roads with ease, body roll for rear passengers is hardly felt. If the road condition is really bad then noticeable body roll is experienced in the front seats. Crosswind sound does creep into the cabin if you drive at high speed on the highway however it is not too disturbing and bearable. A-Pillar is not obstructive so one does not have to be overcautious while taking turns or at crossings. Small size of side OVRM’s does take time to adjust. OEM MRF ZVT 175/65 tyres would be up for swap with Michelin 185/65 tyres next year. When I got the wheel alignment and balancing done recently, the MRF advisor showed me faint lines appearing on the tyre sidewalls which do not look like cracks but I would have to be watchful. No other signs of evident wear and tear were noticed. The beige interior surely gives an airy feel inside however I just cannot prevent my kid from leaving new stains and smudges on seat covers, near the door and window panels, so my car is also due for a proper interior cleaning service. I had got it done once during the 3rd month. Dashboard is nice and simple without too much gloss on the panel edges and since my car stays mostly under shade at office parking the plastic material has not lost its sheen and with regular polishing done during servicing it has maintained proper black levels. I do not find missing storage slots on rear doors or the lack of touchscreen gadgets bothering anymore, various slots which have been provided inside the cabin is well thought of and the concealed mobile holder that opens up like the head of the “Predator” movie alien is the most used utility for me. It saves unnecessary trouble of mounting phone on mobile stands or holders. The boot door has stopped opening up abruptly after second service. I have got compliments on the rear seat legroom from office colleagues and friends and my strain on left leg caused due to repeat clutch action has disappeared thanks to the ergonomic seating of Ford Aspire. I have not felt too tired or exhausted physically even if occasional city logjams tend to get me upset mentally by the time I make it home. 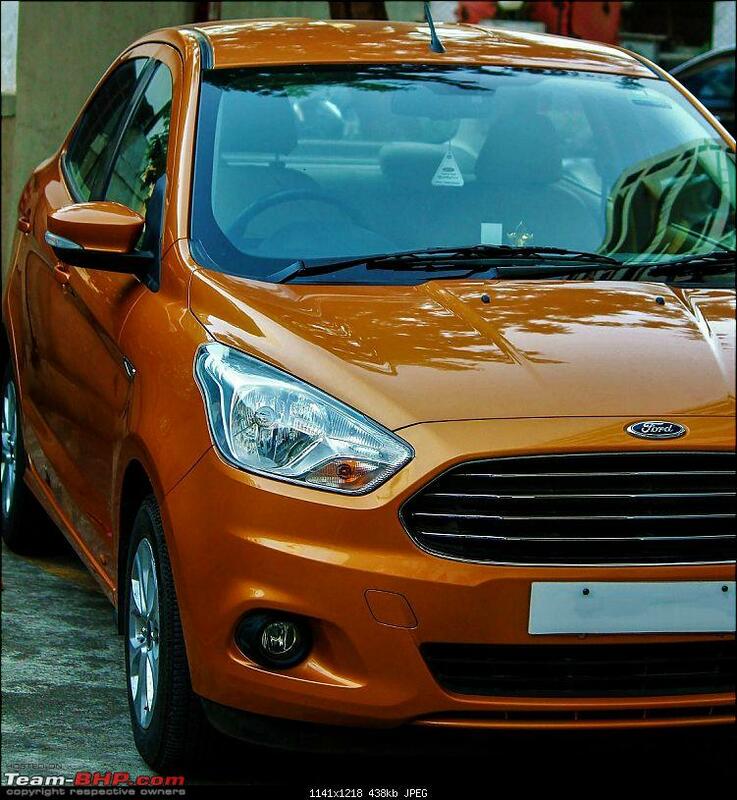 When it comes to exterior the charm of Aspire, it has managed to keep it fresh and classy in a good and bad way! 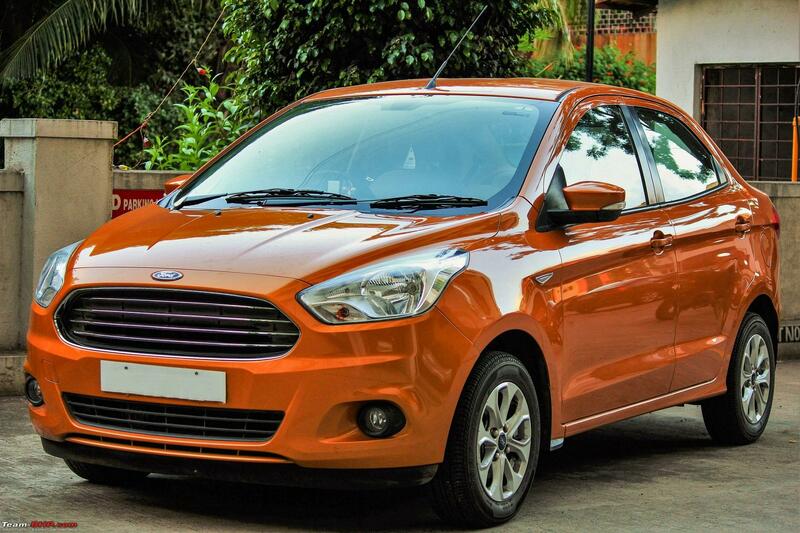 Good because there is no close resemblance of the front grille with any other manufacturer. Side profile, front hood and roof lines are almost a close match to last gen Hyundai Verna. 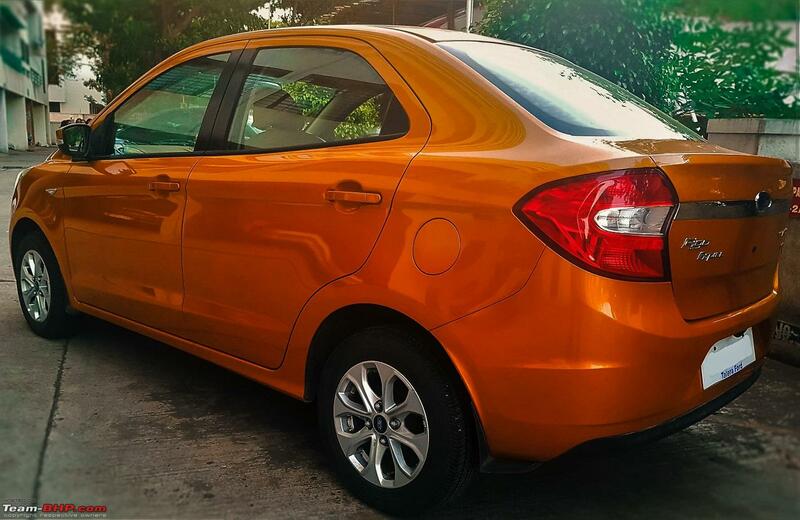 The rear section though looks proportionate it still feels bland like that of Chevrolet Sail. I am surprised that Ford is still not offering rear camera or sensors, they could have surely added these in the package instead of going for a full blown price reduction. 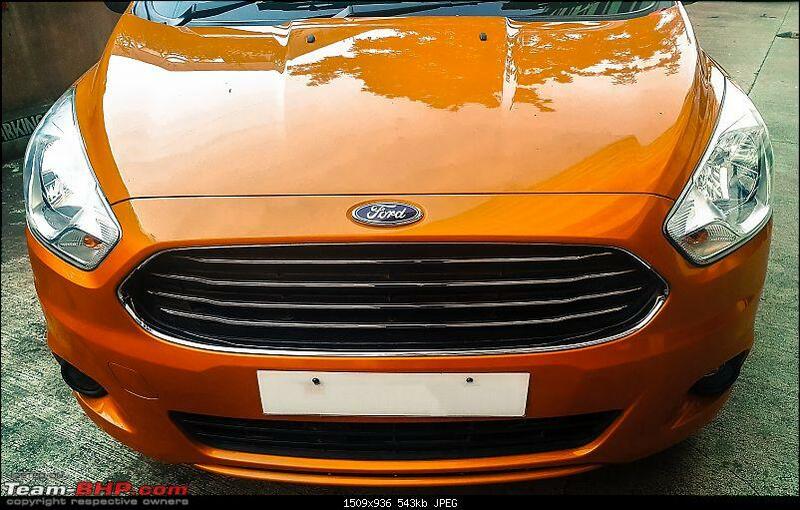 Also like Ecosport Ford should think of providing DRL’s for Aspire and a chrome fitting for the fog lights as this would enhance the front looks. Noticed minor paint chipping at places it is not expected to like the black coat on the external section of the window, few uneven panel gaps have stayed the way they were at time of purchase so no major issues there. I would rate Talera Ford at 6.5/10 in terms of 3 service visits undertaken until now. I took them to task during the second servicing when they first missed out on logging my service appointment in the system and later on I found that my car and personal records were not updated despite sharing car document copies with the service advisor during first visit. The mistake committed in data entry at time of purchase continued to stay as is in their system. After second service was completed I found that the car had polish stains on seat cover and on some sections of beige panels around windows and doors. I immediately got this escalated to the workshop manager who heard me out patiently and offered me complimentary 3M interior cleaning service, had a one to one chat again after the job was done and personally got my records updated in the system. Their workshop customer lounge is not very modern but spacious and staff is friendly and responsive. Service advisors are upfront in giving details of work that is going to be done and follow up on calls is consistent until the car is delivered. The major gripe I have is with their cleaning staff which is not cautious with interior cleaning. I have availed free pick up and drop facility from them, have found executives who come to collect and deliver car to be professional, punctual and patient to note down things you want the service advisor to call you back for. I have spent only INR 2K on servicing cost in the first year and INR 5K paid for a minor dent adjustment and painting work. The dent pressure landed exactly on the Figo Aspire badge which cost the most as some car brushed on Aspire boot door while reversing in an open parking of a dimly lit ground in night. The second free application of 3M coating was also carried out last month. The 2nd year insurance costed me almost 7-8K extra for renewing it via dealer (thanks mobike008 for the next year alert) because I was not sure if I wanted to go for a regular insurance first when Bajaj Allianz contacted me with the original policy, in the meanwhile I was doubtful that the dealer was skimming good enough margin here. I was busy with work commitments and did not take time out to compare plans online so just wanted to get over with the renewal and chose Zero depreciation plan from New India Assurance. IDV depreciation was accounted at 16% from last year. Ford India has been diligent in responding to my emails in general and followed up on my complaint with the dealer during second service. I get feedback calls after each service appointment and alerts via SMS.Figo Twins have not performed well in terms of sales and Ford felt the heat when Creta and Baleno onslaught began last year, It remains to be seen if the last resort they have used in bringing down prices for both Figo and Aspire works out for them or not. Chose to run a full-fledged promotional campaign with Farhan Akhtar to build hype around the launch. Marketing efforts fizzled post launch, I never came across any campaign that maintained a regular connect with the consumers. Manual Petrol engine disappointed many. Ford’s marketing strategy was very subdued with lack of regular advertisements on TV, Radio, Print and even their social media strategy is not up to the mark. One or two TV advertisements that came on air were lame and completely forgettable, companies like Nissan were making their presence felt in events like T20 World Cup, and new Linea launched by Fiat has a TV ad with that girl dressed as fairy sitting in the car with her dad it has high recall value due to the emotional connect. A brand like Datsun managed to score a catchy tune for Redi-Go and their TV adverts felt young and refreshing. Many Ford loyalists blamed the company for going with cost cutting and changing the core ‘Ford Driving DNA’ for which they preferred their cars earlier. Brands like Maruti and Hyundai were correctly projecting Baleno and Creta as slick, modern and mean machines ensuring their advertisements were backed up with consistent print campaigns and their dealers also run their own promotional content in print media. There were also reports of dealers been unable to handle back to back launches which never allowed the company also to devise a strategy for both products to find enough customers. 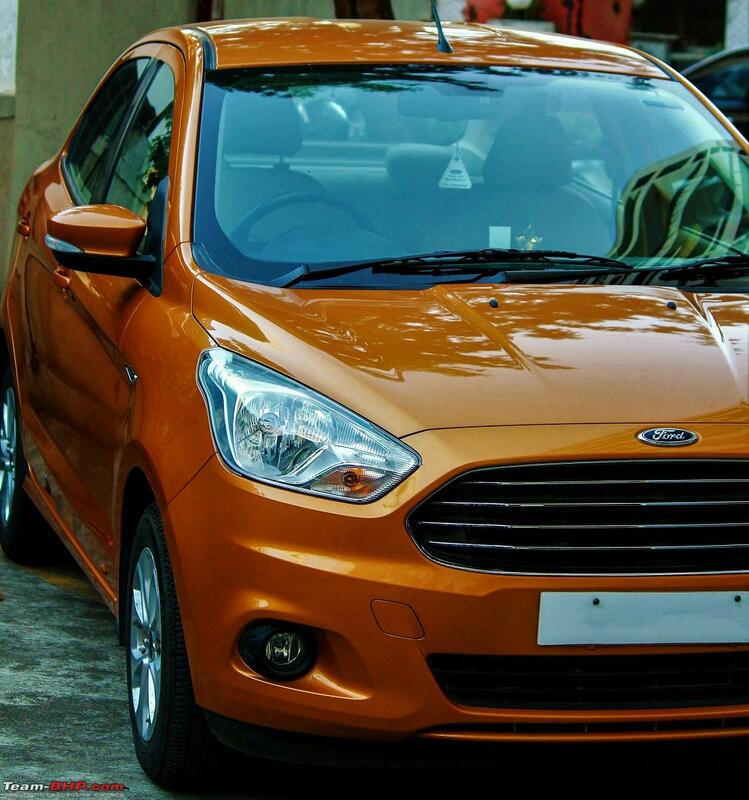 When Ford finally saw things were not going the right way for Figo Twins they woke up to unleash a 200 crore promotional campaign at a time when they were booted out of the race completely, their condition is not deplorable however as a brand they are either operating in denial mode or put off their game where they do not intend to recover soon. Maruti is holding the fort strong in the new launch section with Baleno, Vitara Brezza and Hyundai going strong with Creta and i20 elite. Maruti has even managed to find decent number of takers for the S-Cross after it corrected prices across all variants and their association with the television series ‘24’ has not gone unnoticed. 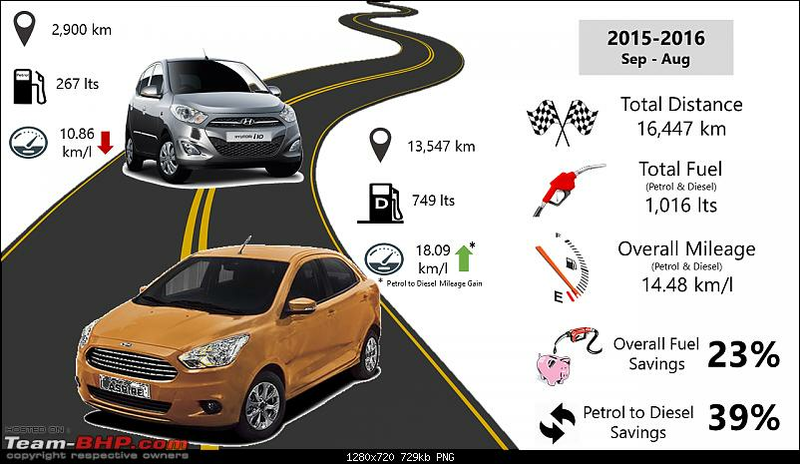 Above points indicate that Ford could have not gone wrong with the Figo Twins however the customer expectations for the passenger car market are evolving at a rapid pace and not all companies would be able to meet it on time and with the right fit product. If a company fails to make the right move at the right time it’s an opportunity lost forever. Minor issues faced – Body rattling problem on LHS side on the rear section and vibrating noise below the dashboard on 1st gear was addressed during 1st and 3rd service. Warranty claims – Music unit had a problem of going on mute randomly when engine used to be switched off while halting at traffic signal. Ford had sent an engineer from Sanand plant to get this verified and replaced it without any cost very promptly. Year One Verdict: First year ownership of my Figo Aspire has been hassle free overall and the blue oval has now matured enough to be named as the Golden Gatsby which is apt to its situation where a product like the diesel version has almost everything in the right place in terms of safety, features, power and balanced economy however it never got the acceptance it could have got for its potential, almost in a situation like Leonardo DiCaprio was before things turned around for him finally this year! 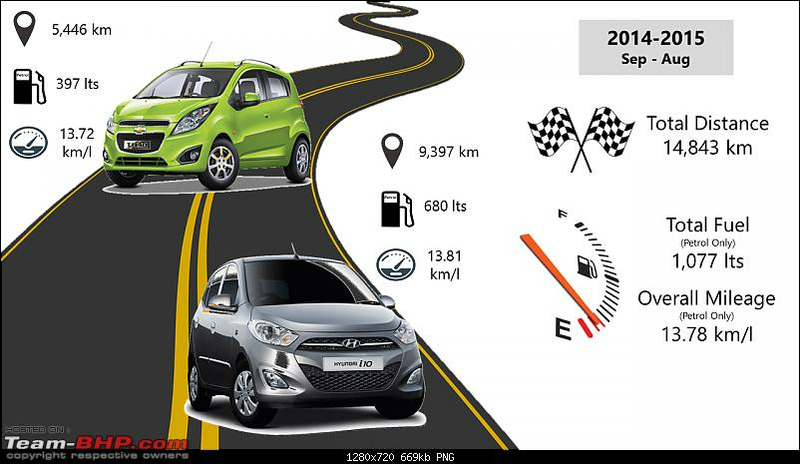 If you are in the market looking for an upgrade to your hatchback or simply interested to drive a powerful diesel car under 10 lakh budget you can test drive Figo Aspire for once before taking the final leap. Always base your decision to go with your requirement and preferences and never get influenced by popular opinion or trends. Tried second assessment of Golden Gatsby’s fuel efficiency this weekend on my Mumbai trip, performed really well in comparison to my last test. 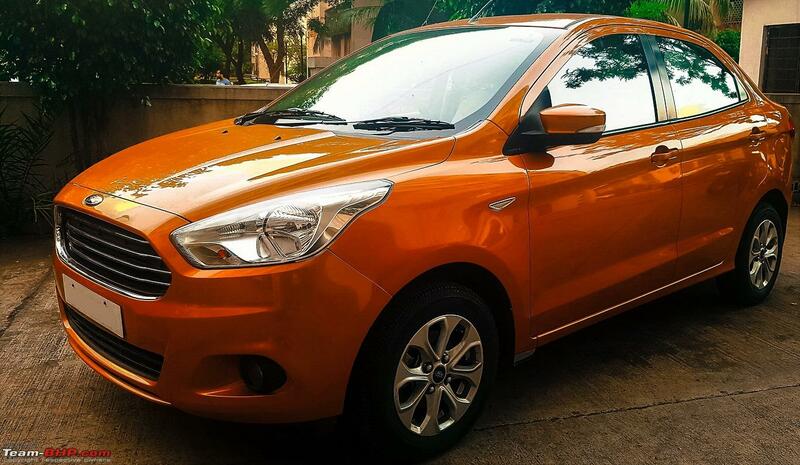 Started from Pune at 14,786 km on the odometer and Aspire clocked mileage figure of 28.9 km/pl on the one way trip. On the return trip back home it averaged to 24 km/pl with a mix of city driving in regular traffic on both Sat/Sun. My Aspire crossed the 15,000 km milestone on this trip. Highway drive was disciplined all along at 80 kmph speed and engine revving restricted between 1800 – 2000 rpm band, only few exceptions where rare push on the pedal was needed for quick overtakes. Now i sifted through all the pages of this thread and enjoyed it as it had frequent updates on ownership and service. I am in the process of finalizing a car purchase, and right now 3 cars are in the league - Baleno, i20 and Aspire and interestingly i can see aspire seems to be the most VFM option with diesel top end almost at a lac more than petrol. And with end of year december sale approaching, i expect some discounts should come in which will make it quite an attractive package. I test drove the car and loved the minimal turbo lag as well as overall visibility, but coming from an i10 kappa2, i felt the seats to be a little bit lower. i stay in PCMC so test drove the vehicle at talera ford, the SA was helpful. @Kretivegeek: Thank you for sharing your ownership and congrats. I have a query to you and other Aspire folks? Is there any option to get Black seat fabrics or any other dark color apart from beige? This is definitely one factor, which is holding me from considering it seriously. Also, is the diesel clatter very audible, with window open? You can definitely go for black seat fabric as it would go well with the beige interiors, there are some good one's available on Amazon India site and about the diesel engine clutter it is only noticeable evidently while you are on first gear with windows open, you would not feel any uncanny vibrations on the steering. Updating this thread after quiet some time, my Aspire is close to completing 25,000 km. on the odometer now.Third service done at 20,000 km in February this year and the invoice amount was exactly close to the online estimate given on Ford website. I have paid Rs 6487 only for 2 service visits between Sep'15 - Jul'17. In this case my wife's 3 year old Hyundai i10 is slightly on the higher side with regards to service cost as the average bill is in the rage of Rs 4500-5000. I had not driven my Aspire in bad road conditions until now and since the beginning of monsoon Hinjewadi traffic started peaking and one evening last month I happened to take the shortcut from MIDC circle near Quadron leading to Maan Devi temple. I was anticipating some part of this 1.7 km. road to be in good shape but it was riddled with potholes all along and I was surprised with the way Aspire handled this bumpy ride without transferring much of the thuds inside the cabin and especially on the steering. This patch is not even in a condition to be called as a road. I was quiet pleased with the ownership review posted by auto_enthusiast for his Aspire cab and it just goes to re-affirm my faith in the product. Great to know that the car is fuss free and serving you well. The potholes and thuds do not travel back to the steering because of the Pull Drift Compensation feature of the EPS. It is supposed to absorb the vibrations and not transfer them to the driver. At least that is what I was told by my SA when I was buying my car. I got tyres replaced on my Aspire this week post a flat tyre incident which thankfully did not happen when I was traveling on Mumbai Pune Expressway. When I got wheel balancing and alignment done at 20K Km run, the service advisor at an authorized MRF outlet near Phoenix mall informed me about noticeable signs of wear and tear on tyre sidewall. He asked me to keep a watch on the tyre condition during the next 5K run, during the last week of June I had driven my car quite a few time over rough and potholed ridden terrain in order to avoid traffic by taking the long route from Maan village in Hinjewadi post that I felt occasional unevenness in ride condition while driving on normal road and light strain on accelerating. Got tyre pressure checked twice at two difference outlets but could not identify if any tyre had got punctured. While on expressway when I was returning to Pune, I noticed that car was having trouble braking in time and I slowed down my driving speed considerably feeling constant drag on the engine. This week on Tuesday while leaving for office I saw that the rear right tyre had gone flat, called Ford road side assistance and a technician came in half hour. He inflated the tyre temporarily post which I took my car to Tyre Trax shop near Weikfield IT park, Tyre tread wear and tear was even on both front wheels and exposed plies visible on all tyres. Got 175/65 R14 Michelin XM2 for Rs 4800/tyre and got the wheel alignment and balancing also done after fitting was completed, Immediate change noticed is that the tyre noise has gone down by almost 70%, I would be posting update later on ride quality and any change in FE maybe after a month or so. This Tyre upgrade happened at 25,167 km on the odometer and also happened to calculate half yearly FE on my Aspire for 2017 which came to 19.31kmpl with 80% city and 20% highway driving. Rated your thread well deserved 5 stars! Could you please elaborate on what was exactly done to eliminate the rattling from the dashboard ? A friend of mine who owns a Figo seems to have having the same problem. Would be good to know the fix you have done. Thanks for the rating, I was hearing rattling noise on the lower left side of the dashboard. It turned out to be some loose panel issue which was tightened during service. All times are GMT +5.5. The time now is 09:55.